1901: March 23,1901. Aguinaldo is captured by the Americans in Palanan, Isabela. U.S. President Theodore Roosevelt declared end of Philippine-American war on July 4, 1902. 1901: Gran Oriente de Francia introduced. On June 18, 1901, Dr. Trinidad Pardo de Tavera organized Logia Rizal under the Gran Oriente de Francia of which he was a member. The lodge was named after the martyred Dr Jose Rizal who affiliated with a lodge of this French Orient in Paris in 1892. Soon followed the establishment of Logia Minerva in Tuguegarao (Cagayan de Luzon), Logia Isarog in Camarines, Logia Tayabas in Tayabas, and Logia Nueva Ecija in Nueva Ecija. 1901: Americans establish a lodge in Manila. Manila Lodge No 342 received its charter dated October 10, 1901 from the Grand Lodge of California. It was constituted on November 14 in the same year. ​1903: Juan Utor tries to form Philippine Grand Orient. Juan Utor y Fernandez a 33° peninsular Spaniard organized Primera Luz Oceania, as Mother Lodge for his proposed Philippine Orient. Organized were Logia Maigting in Paco, Manila; a lodge in Nueva Caceres (now Naga, Camarines Sur); a lodge in Bulacan; and another in Cagayan de Luzon (Cagayan Valley). A year later, the Mother Lodge was dissolved when it encountered financial difficulties. 1903: Gran Oriente de España revives lodges. Abelardo Cuesta, Ramon Martinez, Vicente Barrena, Aurelio Rusca and Ladislao Jose who had served successively as its deputies, led the reorganization of the Gran Oriente de España . Revived were Lodges Luz de Oriente No 228, Luz de Cavite No 230, Luna No 231, Union, Patria, Fraternidad No 232, Rizal No 233, and provisionally, Luz de Pangasinan. Some Triangles were founded in Negros Occidental; Mauban, Tayabas; and Rosario, Cavite. 1903: Gran Oriente Español revives other lodges. With the appointment of Valentin Polintan as Grand Deputy of the Grand Council of the Order in the Philippines (after the reorganization of Logia Modestia No 199 in 1900), the Grande Oriente Español proceeded to restore or organize other lodges. In 1903, Logia Dalisay No 177 was reestablished in Calle Raon in Manila. A third lodge, Logia Sinukuan No 272 (named after the symbolic name of Andres Bonifacio) was founded also in Manila, with Felipe Buencamino as Worshipful Master. 1903: The second American lodge, Cavite Lodge No. 350 was established in Cavite City also under the Grand Lodge of California. Issued a dispensation on October 18, 1902, it was chartered on October 15, 1903 and constituted, November 24, 1903. 1904: Grand National Lodge proposed. The idea was the fusion of the three lodges of the Grande Oriente Español with the two lodges of the Grand Lodge of California in order to form a Grand National Lodge under the jurisdiction of the United States. Filipino Lodges, maintaining that the Grande Oriente Español had primary jurisdiction in the country, did not entertain the idea. 1906: Regional Grand Lodge of the Philippines organized. Timoteo Paez, Worshipful Master of Lodge Sinukuan, with seven lodges as prescribed by the statutes and regulations of the Order, formed the Gran Logia Regional de Filipinas (Regional Grand Lodge of the Philippines) under the auspices of the Grande Oriente Español in a meeting held on September 9, 1906. Elected President/Grand Master was Felipe Buencamino. 1907: Grand Lodge of Scotland introduced. Manuel Camus, a member of the American Manila Lodge No 342 (Grand Lodge of California), on June 1, 1907 met with other Masons at his residence in Calle San Sebastian, to organize a lodge under the Grand Lodge of Scotland. According to Kalaw (1920) Camus' main objective in implanting the principles of Anglo-Saxon Freemasonry into the country was to instill them into the minds of the Filipino Masons who were denied admission to American lodges. The lodge was chartered as Perla del Oriente No 1034 on November 7, 1907. Cebu Lodge No 1106 was organized in Cebu city later. 1912 : Gran Oriente Lusitano Unido charters lodges. In May 1911, members of Logia Luz de Oriente No 228 of the Gran Oriente de España requested affiliation with the Grand Oriente Lusitano Unido, which was the product of the union of the old Oriente Lusitano with other Grand Jurisdictions in Portugal in 1869. Telegram from Lisbon approving the affiliation was received a year after, dated July 9, 1912. Under this Orient, Lodge Minerva No 370 was organized, partly with members of the old Lodge Luz de Oriente. 1915: Grand Regional Lodge elects Teodoro M. Kalaw as Grand Master. On May 15, 1915, Teodoro M. Kalaw assumed the chair as new Grand Master of the Gran Logia Regional de Filipinas. On June 10, during the meeting of the Grand Regional Lodge, he was granted authority to convoke a general assembly of Masons "to discuss "internal and external problems, so serious and so fundamental in fact, that from their solution will depend the life, the honor and the future development of national Philippine Masonry." 1915: Regional Grand Lodge sends protest to the Masonic World. In its meeting of August 8, the Gran Logia Regional approved a fraternal and respectful protest against the constitution of the so called Grand Lodge of the Philippine Islands in accordance with the resolution passed by the Grand Assembly. This was sent through the Grande Oriente Español to the different Masonic bodies all over the world. In the same meeting it was resolved to form the Grand National Lodge of Ancient and Accepted Masons of the Philippines in consonance with the resolution approved on July 5. 1915: Kalaw seeks friendly separation from the Grande Oriente Español. According to Kalaw, while it was well understood by the representatives that to constitute a Sovereign Grand Lodge was an inherent right of duly constituted Lodges; and permission from the Grande Oriente need not be sought, the Grand Assembly wished that a friendly separation could be worked out. The Grand Assembly finally left the issue to the discretion of the Grand Regional Lodge so that "it may adopt the measures or means that it might deem most advisable." Toward a friendly separation, from August 1915 to December 1916, messages and letters were exchanged between Grand Master Kalaw of the Grand Regional Lodge and Grand Master Miguel Morayta of the Grande Oriente Español in Spain. 1916: Grande Oriente Español informed about the tendency toward fusion. The long exchange of letters between Kalaw and Morayta however, yielded no positive indication of the grant of freedom and authority to form an independent Grand Lodge. In a letter dated December 13, 1916, Kalaw apprised Joaquin Ruiz, Grand Secretary of the Order, of the"critical and special" situation of the Filipino Lodges in Manila. Due to the lack of any definite or categorical reply from the Grande Oriente, he warned of the growing tendency of Filipinos to favor fusion with the Americans. He further reported that prominent Filipinos had already held some meetings and decided to advocate openly the fusion unless a favorable decision was received before the scheduled meetings of the American Grand Lodge's Assembly in February (1917). 1917: Grand Master Miguel Morayta dies. The last letter from Morayta to Kalaw was dated December 21, 1916. The letter revealed Morayta’s deep sentiments and his mistrust of the Americans. He reaffirmed the regularity and legality of the Grand Regional Lodge of the Philippines even as he reported that its re-organizational plan was already under consideration of the Grand Council of the Order. On January 18, 1917 Grand Master Morayta died. 1917: Fusion of American and Filipino Grand Lodges pursued. Morayta's death was announced in the Philippines on January 24. According to Kalaw, the death of Morayta cut the last ties that united Filipino Masons with the Grand Oriente Español. By the end of January, committees were formed to discuss the terms of fusion. The committee of the Grand Lodge of the Philippine Islands was composed of William H. Taylor, incumbent Grand Master; Newton C. Comfort and H. Eugene Stafford; the committee of the Grand Regional Lodge was composed of Manuel L. Quezon, Tomas Earnshaw and Incumbent Grand Master Teodoro M. Kalaw. 1917: Committees on fusion draft agreement. After several joint meetings, a six-point draft agreement was prepared, subject to the ratification of each Grand Lodge. It proposed the holding of a joint assembly on February 13, 1917 at one o'clock in the afternoon at the Masonic Temple in Escolta, Manila in order to adopt, with possible amendments, the American Grand Lodge's Constitution; recharter the Lodges of the Grande Oriente; and to elect the Grand Officers. Equal rights and privileges regardless of race was also guaranteed; together with the freedom to adopt any recognized rite and language that a Lodge might choose for its work. 1917: Filipino Lodges ratify draft agreement. On February 2, 1917, the Grand Regional Lodge of the Grande Oriente Español and its Lodges approved the provisions of the agreement. The representatives of the Lodges made preparations for a banquet, scheduled for February 13 (Tuesday) at twelve noon at the Hotel de Francia in Plaza Goiti, Santa Cruz, Manila. 1917: American Lodges reject draft agreement. On February 12 or one day before the scheduled joint assembly, representatives of the Grand Lodge of the Philippine Islands disapproved the terms of the agreement. They rejected fusion by a Constituent Assembly and wanted individual affiliation instead. 1917: Quezon persuades Filipino Masons to accede to affiliation. The scheduled banquet before the assembly was held without the Lodges of the American Grand Lodge but with the attendance of Grand Master William H. Taylor, Dr Eugene Stafford and Attorney Cohn representing the Grand Lodge of the Philippine Islands. After Grand Master Taylor and Attorney Cohn had spoken to the gathering, they withdrew, together with Dr Stafford to let the Filipino representatives deliberate. After hours of deliberation Manuel L. Quezon, who was tasked by the fusion committees to help resolve the situation was able to overcome all opposition and to persuade the Filipino Lodges to integrate with the Grand Lodge of the Philippine Islands by affiliation. 1917: Cable from Madrid arrives. Just before the scheduled assembly, a cable from Madrid was received announcing that the Grand Council of the Order had authorized the establishment of an independent Philippine Grand Lodge. However, it indicated that final decision would have to be rendered by an Assembly to be held in June. The late arrival of this notice rendered the issue moot and academic. 1917: Filipino Lodges affiliate, participate in first Grand Election. On February 14, a day after the aborted constituent assembly, 27 Lodges of the Grande Oriente Español signed the document of affiliation to the Grand Lodge of the Philippine Islands. On the same day, the election of Grand Officers was held. William H. Taylor was reelected as Grand Master and Manuel Luis Quezon (Resident Commissioner to the U.S.) was elected as Deputy Grand Master. Since the superior number of Filipino Lodges could cause dominance in succeeding elections, Quezon suggested the adoption of a gentleman's agreement wherein a Filipino and an American would alternate as Grand Master. 1918: Manuel L. Quezon becomes first Filipino Grand Master of the Grand Lodge of the Philippine Islands. Secretaries of War; Gracio Gonzaga, Secretary of Finance; General Antonio Luna, Director of War; Timoteo Paez, Bonifacio Arevalo and Venancio Reyes, War Commissaries; Military Generals Mariano Llanera, Vicente Lukban, Juan Castaneda, Pantaleon Garcia, Mariano Trias, Jose Alejandrino, Manuel Tinio, Servillano Aquino, Venancio Concepcion and Mamerto Natividad; Francisco Joven, Colonel of Infantry; Jose Sofio Banuelos, Lieutenant Colonel of Staff; and Estanislao Legaspi, Lieutenant Colonel of Infantry. General Emilio Aguinaldo who was in self exile in Hong Kong returned to the Philippines at the onset of the Spanish American war. After a series of victories he declared independence in Kawit, Cavite on June 12, 1898. Aguinaldo with the help of his chief adviser, Apolinario Mabini formed a government; created several departments, appointed several diplomatic agents and formulated a national budget. Decrees were issued for the election or appointment of delegates to a national congress. Local schools were reopened and in Malolos, Instituto Burgos, the equivalent of a national high school was established, together with a university and a military academy. The Malolos Congress convened on September 15 and on January 21, promulgated a constitution which established a republican form of government. On January 23, 1899, the Philippine Republic was inaugurated with Aguinaldo as president. William McKinley was the president of the United States during its war with Spain and the succeeding Philippine American war. Although the Spanish armada was completely destroyed during the naval battle of Manila Bay on May 1, 1898, the ground warfare that would decide the final outcome of the Spanish American war in the Philippines could not be pursued by the Americans for lack of sufficient troops - McKinley was still raising a volunteer army in California. While Admiral George Dewey and his limited troops were waiting for the Eight Army, the liberation of Cavite and other towns in Luzon was achieved by Filipino troops in less than a month. Manila was under siege. Cut-off from possible escape routes and denied of food and water supply, Aguinaldo and his Generals felt that the collapse of Spanish troops and the Spanish colonial government in the walled city of Intramuros was just a matter of time. ​But when the third U.S. expeditionary force finally arrived, the Americans started planning the attack of the city without consultation with General Aguinaldo. The attack was scheduled for August 13, 1898. Aguinaldo received a telegraph message from Brigadier General Thomas Anderson, preventing his army from joining the final assault of Manila on the eve of what turned out to be a "mock battle" scripted by Dewey, General Wesley Merritt and Spanish Governor General Fermin Jaudenes, for the benefit of saving Spanish honor. Aguinaldo and his Generals unaware that the battle was only for show, ignored this message and joined the assault however, they were barred from the subsequent surrender negotiations. Historian Teodoro Agoncillo (1973) would later refer to this treatment of a supposed "ally" and the total disregard of Aguinaldo's role in the on going war as the American apostasy. William McKinley was made a Mason in 1865 at Hiram Lodge No.21, Winchester, Virginia. Theodore Roosevelt joined Masonry in 1901 at Matinecock Lodge No. 806, Oyster Bay, New York. On December 12, 1898, it became clear that the United States had no intention of respecting Philippine independence when President McKinley, even while the U.S. Senate had yet to ratify the Treaty of Paris, issued his so-called "Benevolent Assimilation Proclamation" declaring sovereignty over the country. He then created on January 21, 1899 the First Philippine Commission (Schurman Commission), composed of Cornell University president Jacob Schurman, General Elwell Otis, Admiral George Dewey, Charles Denby and Dean Worcester. The five-man body was tasked to investigate Philippine conditions and make recommendations. It made its report to McKinley on January 3, 1900. Among others, the report declared that the Filipinos were not ready for independence. At this time the Philippine American war was in its eleventh month. The Philippine American war started on February 4, 1899 when two U.S. Army volunteers shot three Filipino soldiers in the Manila district of Santa Mesa, killing one of them. Retaliation from Filipinos resulted in full scale American naval and ground offensives against Filipino positions the following day. Because of the war, the strong opposition to the annexation of the country was overcome and the Treaty of Paris, providing for the cession of the Philippines to the United States was ratified by the U.S. Senate on February 6,1899. 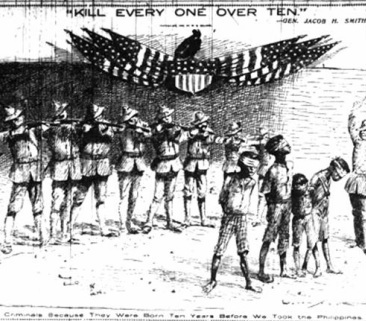 The brutality of the Philippine American war was depicted in a caricature criticizing General Jacob Smith's kill and burn tactics in Samar, printed by the New York Journal on May 5, 1902 captioned "Criminals Because They Were Born Ten Years Before We Took The Philippines." 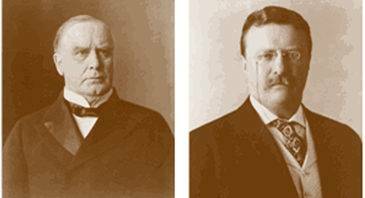 President William McKinley was assassinated on September 6, 1901 and was succeeded by his Vice-president, Theodore Roosevelt. Under Roosevelt, the war was pursued with more aggressive force and his army would be charged with numerous atrocities. Roosevelt announced the end of war on July 4, 1902 but the war of attrition would last for another decade.